Sales Tax rules have changed for the state of Colorado. As of December 1st 2018, I am no longer able to offer shipping options for my COLORADO customers located outside the Westminster City/Jefferson County area. Please see my blog or click here for more details! For more information about part availability and other news, don't forget to check out my Blog and Facebook Page! Car Rosaries Make a GREAT Gift! Customize Your Own Speziale Rosary Today!! For more information regarding your own custom rosary, please see the details beneath the purple info box below. 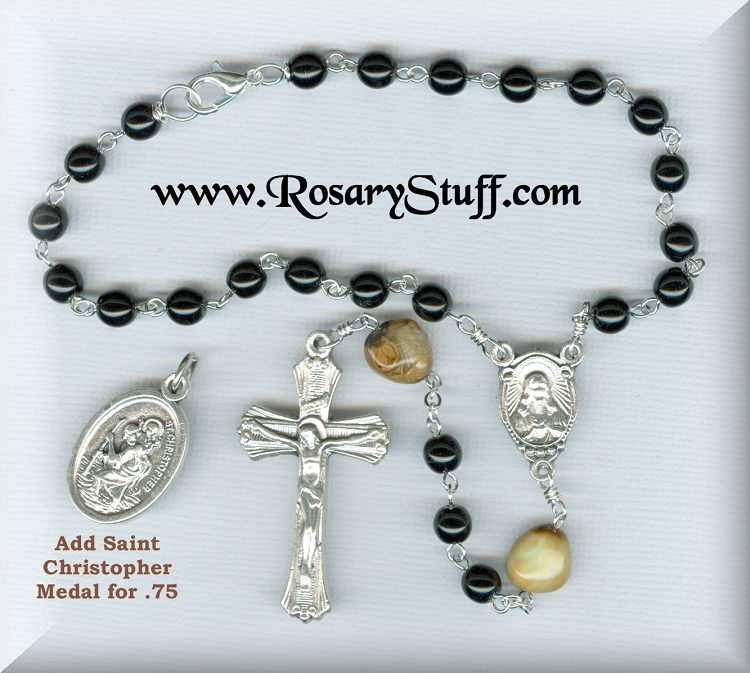 To check out all of the wonderful beads, parts, and medal options available for my custom rosaries either click the image below or choose custom rosaries from the menu. And remember, if you are interested in something I don't have listed, please don't hesitate to contact me for availability. If you need some ideas, or just want to see what others have chosen, don't forget to visit my Online Photo Gallery. And as always, if you have any questions, need help, or prefer to place your order via e-mail, please feel free to contact me. I'm here to help! Flat rate U.S. shipping is $3.50 (when paid with ONE payment) + Free delivery confirmation on all orders. Free upgrade to priority for orders over 1 pound. Important: if the “Ship To” address on your Speziale account and your PayPal accounts don’t match, please verify which shipping address to use in the comment section of your order. I'm sorry but I only ship within the USA and Canada at this time. I ship orders Monday through Friday and some Saturdays weather permitting. Colorado residents: starting December 1st 2018, due to the new sales tax laws I can no longer ship within the state (except for Westminster/Jeffco residents). Please click here for more information. Everything is 100% guaranteed. If you don’t like your items, you can return them for a full refund (except for custom rosaries and special orders). Return postage is the responsibility of the customer. CLICK HERE FOR MORE INFORMATION regarding all of our policies including those above as well as copyright, legal info, gov't lead restrictions, confusion with rosary part listings, and other order help. Please Remember: Speziale rosaries are not intended to be used as jewelry. Since I am not a jewelry maker, I honestly can't say how a rosary (including the various wires and beads) would hold up if worn as a necklace. Now is the Perfect Time to Create Your Own Custom Rosary!!! What makes a custom rosary special is the fact that YOU choose the design. It is a true gift from the heart, for yourself, a friend, or a special loved one. For those who know exactly what they want, simply add all of your choices to the shopping cart and complete the transaction as you normally would. Once the order is received I will send you a picture (via E-mail) of your choices together so that we can make sure everything looks the way you want it to. 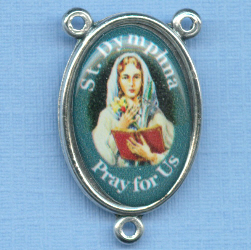 Then, once the rosary is completed, I'll send another picture for final approval before shipping. Please allow a few extra days or so for completion of your rosary and remember that prices shown do not include things like sales tax, shipping, or insurance charges. For those who would like to customize a car or other single decade rosary please remember the size of the bead will alter the length of the rosary. For example a car rosary made using 6mm beads will be shorter than one made from 8mm beads. The size of the center and crucifix can sometimes also affect length, so if you need a shorter rosary for your rear view mirror, using smaller parts and beads is the best way to go. For those feeling a little overwhelmed by the whole process or who are having a difficult time narrowing down their many choices please don't hesitate to send me an email. You would be surprised how much a picture or two can help make the decision process easier. 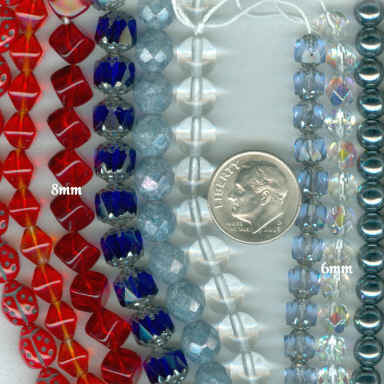 So, if you need help, would like to mix colors and/or types of beads, or would like to see pictures of certain items next to each other before making your final decision, please let me know. These steps will help guild you through the design process. All bead options can be found here. Each section is organized first by type (i.e. Czech and Chinese Glass, Swarovski Crystal, Stone, Pater Options including filler beads) and then alphabetically. If you prefer to see your bead options listed by price, simply choose that option from the drop down menu just above the product listings. Czech Glass Beads: Certain shades of reds, blues, blacks, etc. are listed by name, not by color group. For example: Black colors include black diamond, hematite, jet, and matte jet. Blue colors include luster stone blue, Capri, Montana, cobalt, deep luster, iris, light sapphire, alexandrite, and regular sapphire. Brown and gold colors include jonquil yellow, dark bronze, luster champagne, and light, medium and smokey topaz. Green colors include peridot, emerald, lime, olivine, opal turquoise, and prairie. Pink colors include rosaline, fuchsia, light rose, rose, and soft pink opal. Purple colors include alexandrite, amethyst, iris, tanzanite, violet and lilac pearl. Red colors include garnet, light Siam ruby, Siam ruby, and regular ruby. Stone Beads: Since STONE bead options are always changing, I often have extras, or full strings of beads not yet listed. If you are unable to find a particular stone, either for Aves or Paters, it is always a good idea to contact me for availability. My new Stone Availability Page will also give you an idea of what beads I may have in stock. Sometimes I may not have enough of your favorite stone for an entire rosary, but mixing in other glass beads, wood beads, or a different stone gives us the opportunity to create something really unique and special. Pater beads (Our Father beads): Simply click here to get an idea of what stone and glass options are available. Step 2: Choose your wire and chain. All custom rosaries are made with my basic wire/chain option similar to most store bought rosaries (22 gauge Italian silver plate wire with Italian silver plate flat link chain). But if you want to upgrade to something more sturdy (20 gauge), or a different finish, upgrades are available for an additional cost. See below for pictures and information regarding different finishes, thicknesses, and prices. Step 3: Choose your favorite Center and Crucifix. 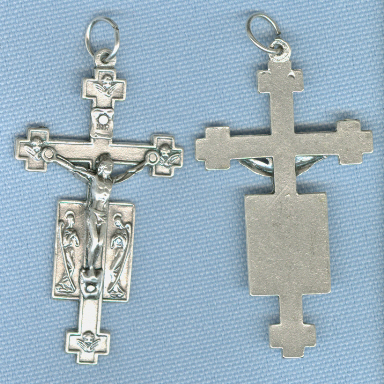 You have many, many center and crucifix combinations to choose from including Italian silver and gold plate, American made silver plate, pewter, gold plate over pewter, and sterling silver. These links (Centerpiece ChoicesCrucifix Choices, Matching Sets) will give you an opportunity to see all of your available options. 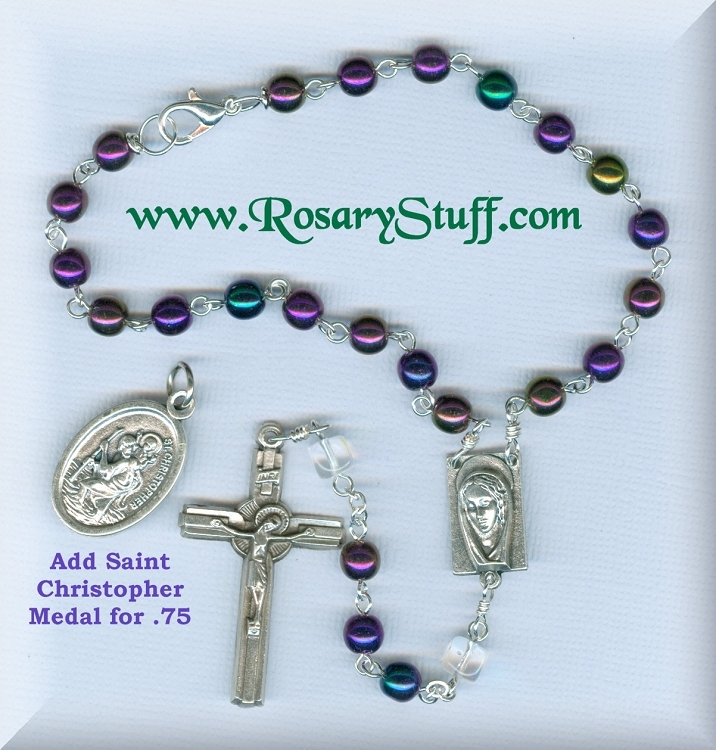 Medals and charms are a great way to add character and individuality to any rosary. Click here to check out what's currently available including inexpensive silver late options, gold and silver plate medals, and my own Fibromyalgia, Breast Cancer, and Liberty charms. And remember, if you want to combine various colors or types of beads, place your order via email, or if you just need help narrowing down your choices, please feel free to contact me. I would be happy to help! Below is all of the information you will need, including pictures, to help you choose the best wire and chain option for you. Just click on the image to see a larger version. For those considering plated wire, please keep in mind that with extensive use, the silver plating may wear off exposing the copper core. So if you plan on using your rosary every day and usually hold your rosary by the wire (instead of the bead) you might want to consider upgrading to sterling silver or silver filled wire to avoid some of the wear issues associated with silver plating. If you have any questions, please let me know. 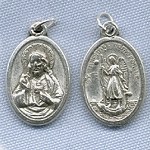 (Similar to that used on most inexpensive store bought rosaries). 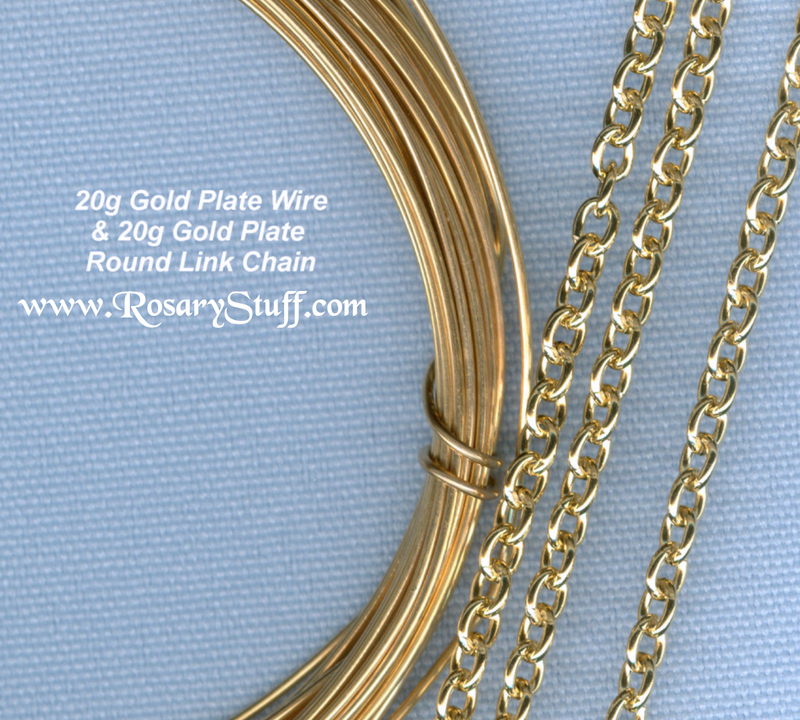 This thicker wire and round link chain option is stronger than most store bought rosaries and looks great with gold plated parts. The wire features a thin layer of gold plating over a copper core. This thicker wire and round link aged silver plate chain option will balance nicely with the aged finish on many of my Italian silver plate rosary parts. Silver plate wire means there is a thin layer of silver plating over a copper core, so constant rubbing on the wire could result in the silver plating wearing off over time. Some people like this option because (unlike the aged silver plate chain) sterling chain has a bright silver finish similar to that of the wire. Silver plate wire means there is a thin layer of silver plating over a copper core, so constant rubbing on the wire could result in the silver plating wearing off over time. 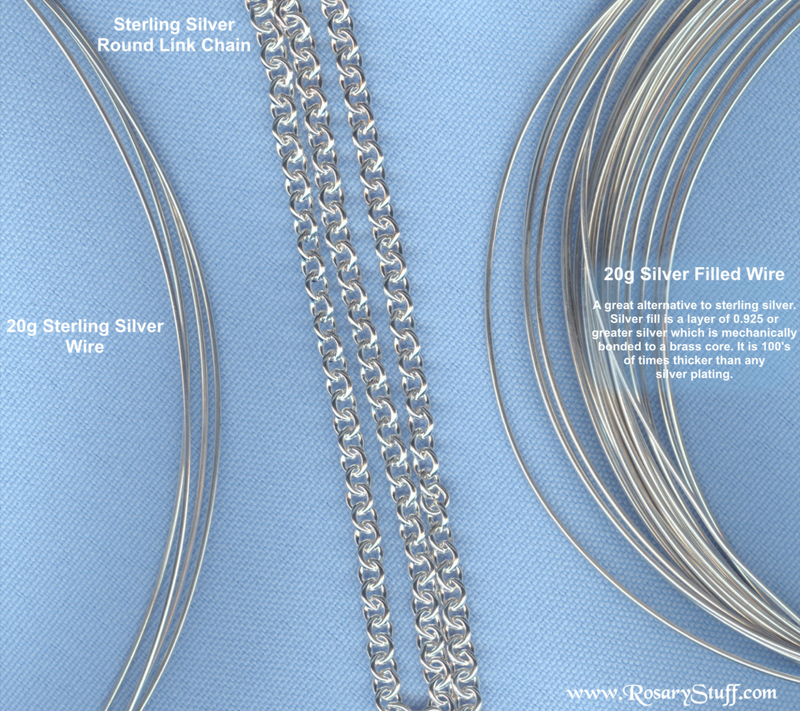 My solid sterling option includes both sterling silver wire and chain. 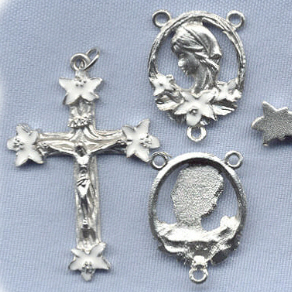 Together they have a bright silver finish that looks great with any rosary, especially one made using sterling parts. The above pictures shows both sterling wire and chain along with my new silver FILLED wire option. See blow for more information about silver filled. Silver filled wire is a new option here at Speziale. Over recent years we've watched the cost of precious metals sky rocket resulting in major increases in silver prices. As a result, I wanted to try and find something in-between sterling and silver plate. I wanted something that was more durable than silver plate, but didn't have the high costs of sterling. As I've said before, with extensive use, silver plating can wear off over time exposing the copper core which changes the color of the wire some. The difference between silver plate and silver filled is in the plating. Whereas silver plating involves a thin layer of silver over copper and sterling is almost all silver, silver filled wire is a layer of 0.925 or greater silver which is mechanically bonded to a brass core. It is 100's of times thicker than any regular silver plating. 1/10th silver-filled items are at least 1/10th silver by weight, which means the plating will endure longer. The silver filled wire pictured above (with the sterling options) can be paired with either my round link sterling silver or silver plate chains, depending upon your personal preference. To see what the silver filled wire looks like, either click the image above (in sterling section) or click here.